Almost a year of planning, and finally Alex & Lance's big day was here. Both Kulima Point and the 18th Green at Turtle Bay, was just about ready for their big day. Every detail, email, phone call, design idea and layout had all fallen into place to create a gorgeous wedding. From the fun mini 3D statue of the couple with their two dogs that sat perched on their wedding cake, to the beautiful orange floral arrangements, to the last minute oh-so-posh lounge set-up's and hand-drawn calligraphy signs ... every piece was carefully thought out and fell into place perfectly. We would not have had it any other way for this lovely couple! To top it all off all the guests had an absolute blast and there was so much love in the room we could hardly stand it! 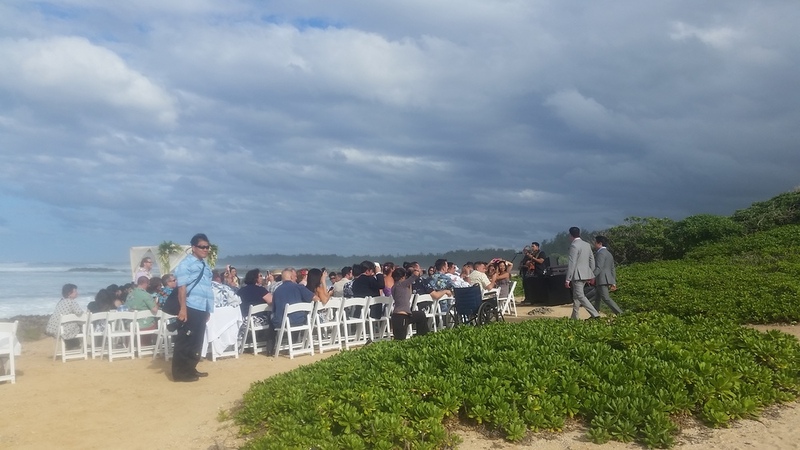 Congratulations Alex & Lance, we hope your Hawaii wedding was everything you imagined it to be! We were honored to be a part of your "Best Day Ever". We wish you both a lifetime of LOVE, kisses, and many more one amazing celebrations! A BIG Congratulations to Lance & Alex!